Tony Eyers is the creator of this site. He was born in Australia and began playing harmonica in the 1970's while an undergraduate at Yale University. He returned to Australia in the 1980's, and became a well known blues player. In the 1990's he developed a new harmonica style, based on the traditional fiddle tunes in bluegrass and Irish music. His recordings of these traditional tunes have become well known within the international harmonica community. 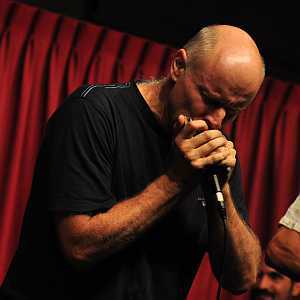 Tony has been an invited presenter at the SPAH harmonica convention in the US, the 2008 and 2010 Asia Pacific Harmonica Festival and the 2009 Highlands Harmonica Festival in Malaysia. 2010 also featured a concert tour of Taiwan. Tony founded the Harmonica Academy teaching site, with lessons for diatonic and tremolo harmonicas. He also created the Chinese Harmonica University site www.kouqin.com.cn (kouqin is the Chinese pinyin word for harmonica). The Chinese site has become very popular, and with over 58000 members is the largest harmonica teaching site in the world. In 2010, Tony launched a Spanish harmonica teaching site Academia de la Armonica, at www.armonica.com.es. Other music sites by Tony Eyers are here. Tony has a PhD, a Bachelor of Science and a Diploma in Education. He has more than 20 years experience designing educational programs. This combined experience has underpinned the Harmonica Academy site development. "The last time I heard skill of this level was at the SPAH Convention final concert in 1985 when Don Les played." Colin Mort, "Harmonica World" reviewing the ‘Black Mountain Harmonica’ CD by Tony Eyers.